Composed by Felix Mendelssohn, Charles Wesley. 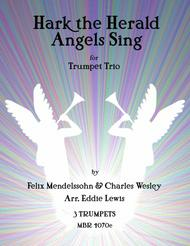 Arranged by Eddie Lewis. 20th Century, Post-Romantic, Sacred, Christmas. Score, Set of Parts. 12 pages. Published by Tiger Music (S0.538533). When I posted the video of this trio online, someone left a comment saying that it sounds like Hindemith. I think that pretty music sums it up. This is a twentieth century arrangement of the classic Christmas carol. The highest note is an A above the staff, so it's not difficult in a physical sense. There are some diminished scales and other chromatic material that can be a little tricky with the fingerings. There is also some rhythmic trickiness on the second page that makes the piece very fun to play.